Please support your favorite dj by giving your vote! Please spread the love and vote for your favorite dj so we can finally give them some recognition for all of their hard work. Votes will be open on 31 January and accepted until Saturday 6 February, 2009. Winner will be announced on Saturday the 20th of February, 2009. 1. You can vote for multiple DJ's. 2. We’re keeping it REAL so your IP addresses will be logged and therefore multiple votes will be discounted. 3. Voting closes on 6th of February 2009. Before the Energy is THE pre-party to worlds biggest tranceparty, Trance Energy. Once again Luminosity pushes the boundaries of Trance to bring you an array of talent of the most prominent names along side the cutting edge up and coming talent. Expect lasers, a massive crowd and expect a party atmosphere like only Luminosity can deliver! 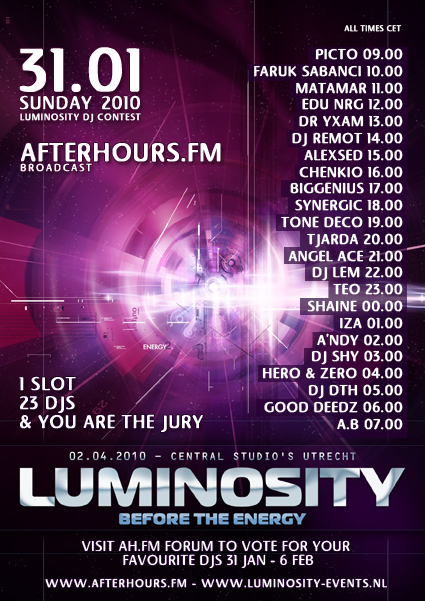 Organized by Luminosity Events, you can see on the flyer one spot taken by "DJ Contest Winner". Winner will do the warm up and closing of room 2 !! Now, the contest has already been closed and the 23 finalists are known but there's still no winner. The winner will be picked by the Luminosity jury, but CAN be influenced by YOUR votes! Last edited by trancefan0883; Feb 23rd, 2012 at 15:53. Now, the contest has already been closed, but there's still no winner. The Luminosity-jury will pick the 23 best sets of all the entries. Those 'semi-finalist-winners' will make a new set which will be aired here on AH.fm. The winner will be picked by the Luminosity jury, but CAN be influenced by YOUR votes!